UnSit's photography is a clear indication of the fitness equipment roots of the company, and the lack of any understanding of walking ergonomics (good luck using that laptop at that angle-while walking, no less). The UnSit Walk-1 has just recently quietly appeared on the marketplace, and we are endeavoring to get one into the test lab for a full-fledged review. The Walk-1 is an extra-wide, extra short treadmill base with a 2 mph top-end speed, designed by former fitness equipment industry executives, and priced at $1,695. The Walk-1 has a desktop controller with a speed knob and start-stop switch on it, but you need to use your smartphone to get any readings out of the treadmill—such as time, speed, distance, calories, and steps. Our treadmill desk expert review staff has seen a lot of office treadmills over the years—all of them, actually—and we have to say we're a bit perplexed about the unexplained rationale for the dimensions of this unit. There are no specifications on the website for walking belt dimensions, motor rating, noise signature, power consumption, or for that matter, just about any other specs you'd typically see on a treadmill. 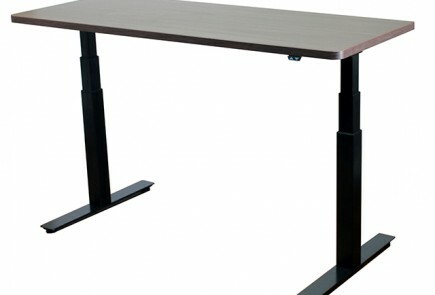 The same paucity of specifications goes for the generic height-adjustable desks, which are likely also made in Asia. The airy copy and photos on the website leave out a lot of information a consumer would want to know before plunking down $1,695, or $2,490 for the integrated system including a desk. We found out more info from their Amazon listing, but not nearly enough. We did discover the unit weighs 162 lbs., making it the heaviest of all the standalone treadmill bases we've seen. The question our expert reviewers ask is, "OK, but why?" The benefit of the shorter and wider form factor is unexplained. Proclaiming to be "The First Treadmill Specifically Designed For Your Standing Desk"
Nice marketing copy, but quite a stretch considering that UnSit is about ten years late to the party. Sorry, we have to chortle a little bit over this assertion. It sounds more like these gym jocks just discovered the standing desk phenomenon themselves, and still have a few things to learn about the ergonomics involved in using a computer while standing or walking. They don't even seem to understand the audience (our readers) who tend to be a few years older than the millennials in the photographs staring above their blank laptop and tablet screens. While we've reviewed several office treadmills with walking belts that were too narrow—like 16 meager inches—solid ones like the iMovR ThermoTread GT have ideal 20 inch-wide belts, and the perfect length (50") for the stride of even the tallest user, without wasting an inch of floor space. We've evaluated some, like the now-defunct Woodway, that had belts so short that you could feel the rear roller at the end of your stride—a definite safety hazard, and more appropriate for a doggie treadmill, or one marketed only to Lilliputian office workers. The UnSit site doesn't explain the rationale for the extra width, either, which may be a problem fitting under certain height-adjustable sit-stand desks. According to the specs on Amazon, the total footprint of the treadmill base is 39 x 56 inches, with 5-inch step height. It's hard to surmise the actual belt length from the photos or even from the provided not-to-scale diagram, but our guess is we're looking at a belt that is shorter than the ideal, and nominal, 50 inches we like to see on a walking treadmill. Update: It's 40 inches long. One aspect to keep in mind is that longer treadmills such as the ThermoTread GT or the Lifespan TR5000 have a smaller footprint in reality than the published specs reveal--due to the fact that you can push a portion of the base under your desk. While the UnSit Walk-1 appears smaller, when comparing entire treadmill desk workstations, the total footprint dimensions will be comparable. An average treadmill base will sit 24-30" under a desk (given normal desk depth). Among the missing specifications on this product is the lack of a UL certification declaration. Based on our familiarity with the current UL standards for treadmills (#1647) we'd be surprised if the UnSit Walk-1 would pass the requirements. One clue is the lack of a safety clip lanyard with the telltale red snap-in clip and yellow border. Without a UL certification for the US market, corporate, government, and education customers may prohibit its use on their campuses. 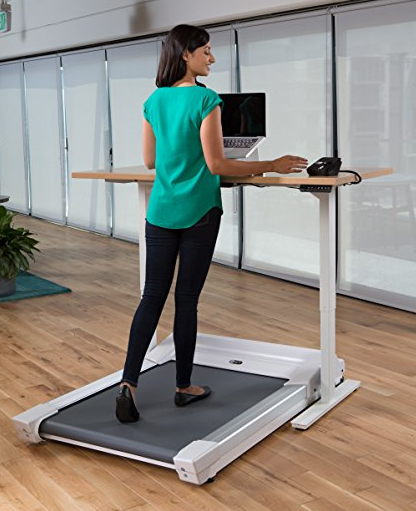 The UnSit also lacks a click-wrap liability waiver that most employers want to see in any treadmill desk product. The company claims on its Amazon listing that it does carry a TUV Rheinland (German) certification, so at least it's not likely to catch fire when plugged in. The desktop console for the UnSit Treadmill Desk has no readouts - you'll need your SmartPhone app turned on to see those. UnSit adjusted their warranty on the Walk-1's motor, with three years on all parts to be on par with full-sized units like ThermoTread GT and the LifeSpan TR5000 that both carry a three-year warranty on the motor. With its 350 lb user weight rating (compared to 400 lbs for the ThermoTread and TR5000), the Walk-1 appears to be more in the class of the Lifespan TR1200-DT3 walking treadmill, which has the same weight capacity and a close motor rating. To see how the other walking treadmill bases on the market compare, check out our comprehensive Standalone Treadmill Base Reviews. To see how the UnSit compares to other complete walking workstations, check out our comprehensive Integrated Treadmill Desk Reviews. 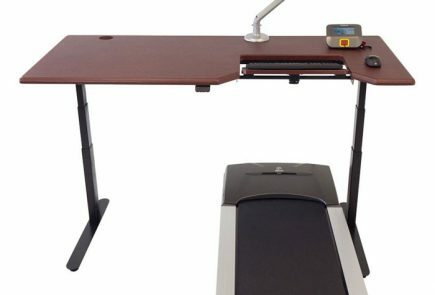 Note that WorkWhileWalking has reviewed every treadmill desk workstation that has ever been introduced since the inception of the industry, starting with the Steelcase Walkstation back in 2007, and including the more recently introduced ThermoTread GT, NordicTrack, ProForm, InMovement, RebelDesk, and of course the Lifespan TR800, TR1200 and TR5000 treadmill desks, as well as the now-defunct TreadDesk and Woodway. While UnSit's website does have a handful of curated customer testimonials, there are no user reviews yet on Amazon, the first place we ordinarily check for unfiltered reviews. There is also no seller feedback on Amazon as of yet, which is listed as Prime Gear Direct. At first glance, our expert review team's reaction is more of a "huh?" than a "wow! ", but we're looking forward to testing the real article and finding out what about this treadmill base its Los Angeles-based manufacturer felt merited a $1,695 price tag. Stay tuned for a complete overview by our treadmill desk expert review team. Subscribe to our free newsletter to stay on top of the latest developments in the office fitness industry.